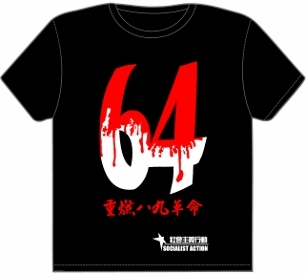 Chinaworker.info – Hong Kong: The National Anthem Law is coming – and more political repression! Hong Kong: The National Anthem Law is coming – and more political repression! The Hong Kong government has presented to the Legislative Council (Legco) a draft National Anthem Law. The Legco, a largely rubber stamp ‘parliament’, is now wholly under the control of pro-government parties after a spate of purges and rigged by-elections to downsize the influence of the pan democratic opposition. So barring a major upset the law will be passed in July this year, as is already the case in China and Macao. This law was originally created as a weapon against the youth of Hong Kong who oppose the control of China’s dictatorship over the city. It aims to silence their protests at football games when they have regularly booed during China’s national anthem. But along with the banning of the right-wing pro-independence HKNP, banning of other parties’ candidates on similar “separatist” grounds, and jail sentences for localist politicians such as Edward Leung Tin-kei, the new law can be used to escalate the white terror against the pro-democracy struggle in Hong Kong. 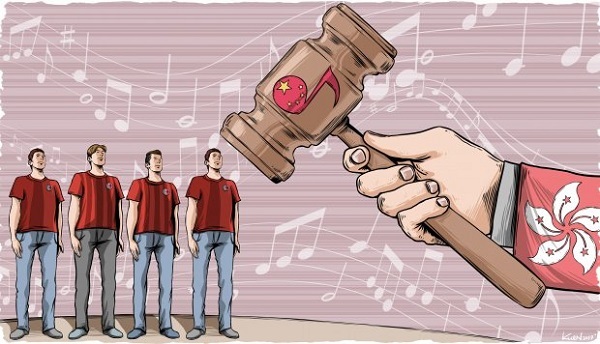 According to the government’s draft, whoever “insults the national anthem” can be sentenced to imprisonment for up to three years and get a fine of up to HK$50,000. However, the definition of “insulting” is extremely vague. It can be illegal even if you sing the national anthem in the wrong way or adapt/change its lyrics or tune. The law aims to create fear among the masses. The draft does not propose a retrospective effect as feared, but allows a two-year time limit for prosecution, much longer than the usual six-month time limit. This can be an extra weapon for the police, for example using video surveillance at football matches or demonstrations, to spread fear. Elected legislators will also be required to sing the national anthem at their swearing-in ceremonies. Patrick Nip Tak-kuen, the Secretary for Constitutional and Mainland Affairs, said that if the legislator-elect fails to do it without any reasonable explanation, he or she may be disqualified in the same way that six opposition lawmakers were disqualified in 2016 and 2017 for allegedly failing to take a “sincere” oath. So the law is also for stepping up the crackdown inside the Legco. The law will also incorporate national anthem education into primary and secondary schools, which means that students may also fall foul of the law while the government’s creeping school brainwashing programme will be strengthened. Even pro-government politicians feel uncomfortable about this. Kenneth Lau Ip-keung, chairman of the rural authority, says that they won’t students sing the national anthem at their events any more, for fear of breaking the law. In 2017, the National People’s Congress (China’s pseudo parliament) included its own National Anthem Law in Annex III of the Basic Law (mini-constitution) of Hong Kong. The laws listed in Annex III are required to be applied in Hong Kong. Annex III is increasingly being used by the dictatorship of China’s “Communist Party” (CCP) to impose its orders on the city. This shows that the Basic Law is absolutely no guarantee of democratic rights as pro-government politicians and most pro-democracy politicians claim. “One country, two systems” means whatever the CCP dictatorship wants it to mean. In the face of this escalating repression the moderate pan-democrats are not prepared to lead resistance, but are looking to retreat. Claudia Mo Man-ching, the convener of the pro-democracy legislators, even said that in principle pro-democrats do not oppose the National Anthem Law, but only oppose “criminalisation”. This means that as long as the government is willing to reduce the penalties, the pan-democrats are likely to accept the law. Fred Li Wah-ming of the Democratic Party even publicly supports the law and compares it to Germany’s legal ban on Nazism. But today’s struggle against the National Anthem Law is just a rehearsal for the looming struggle against ‘Article 23’ state security legislation, which will trigger a much bigger crackdown on democratic rights. Especially if an initial version is muted, the moderate pan-democrats are also likely to accept the state security law with some cosmetic modifications. However, after the law is passed, the CCP will certainly try to toughen and extend the law. 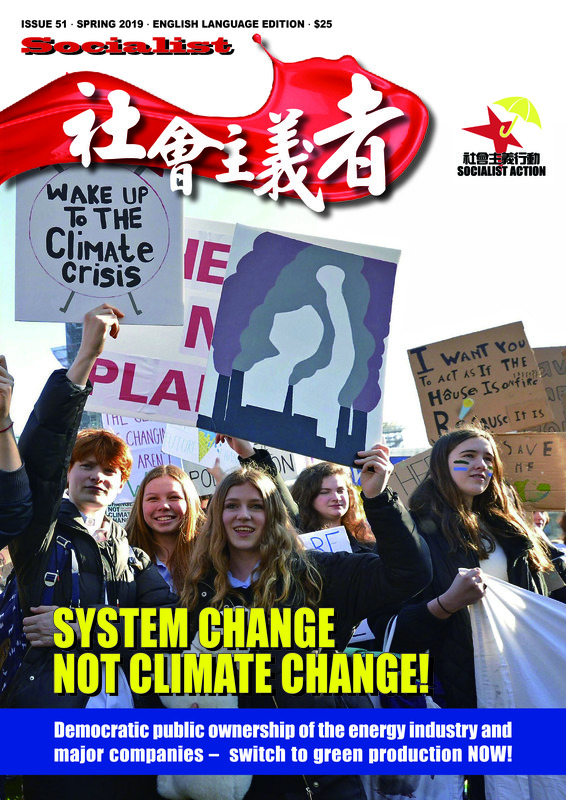 It is necessary to completely rebuild the democracy movement from below, replace the moderate pan-democrats who only compromise and fear mass struggle, and unite with struggles of workers in mainland China against the dictatorship of CCP and billionaires.